Would You Be A Pepper For EA DLC? 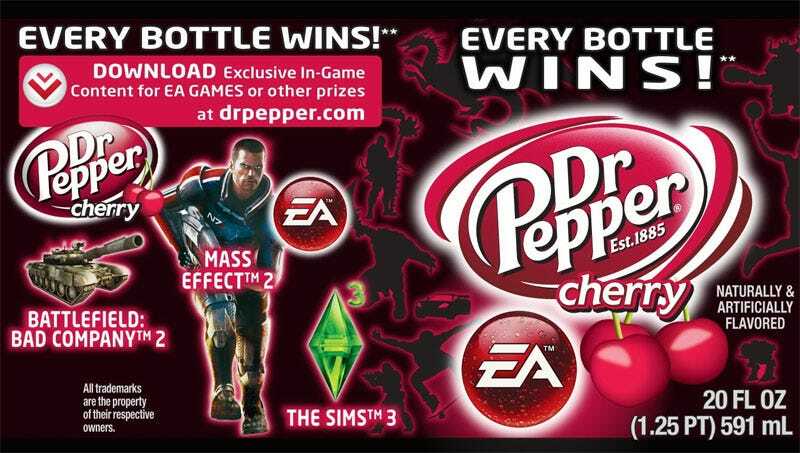 Starting this week, specially marked 20 ounce bottles of Dr Pepper will contain codes good towards exclusive downloadable content for popular EA games, including The Sims 3, Spore, and Mass Effect 2. Dr Pepper isn't a soft drink you'd normally associate with video games. The soda brand and EA are looking to change that now, by placing codes for exclusive DLC under the bottle caps of specially marked 20 ounce bottles of America's favorite brown carbonated beverage that isn't Coke or root beer. Mass Effect 2, Battlefield: Bad Company 2, Battlefield Heroes, The Sims 3, and Spore DLC randomly lurks under said caps, so if you're aiming for a certain theme-based bundle for The Sims 3, be prepared to open a lot of Dr Pepper. You don't have to drink it, but opening it is unavoidable. "We wanted to give consumers an unrivaled experience by offering a range of valuable game enhancements that elevate their experience within the games and create brand affinity," said Tony Jacobs, vice president of marketing, Dr Pepper. "The EA promotion gives fans an unbelievable gaming experience that they can only access through Dr Pepper." Game enhancements for The Sims 3 feature theme-based bundles including Vintage Vegas, Beach Party, Celebrity and Football. Consumers will be able to download exciting new content ranging from a party top or hot boots all the way to a cool Retro car. Fans that have played The Sims over the years will recognize items inspired by previous The Sims games like the Lips Couch or Boomerang Window. In Spore, a dozen Cyborg-themed body parts – such as eyes, heads and arms – can be redeemed and used in the Spore Creature Creator. These parts allow players to mix robot and organic creature body parts to design their own Cyborg creatures. The exclusive Cyborg parts will be usable by all owners of the Spore PC game and anyone who downloads the free Spore Creature Creator Trial Edition from the Spore.com website. In Mass Effect 2 (shipping January 26th for the Xbox 360 videogame and entertainment system, PC), a shooter RPG from EA's award-winning BioWare™ division, there are three unique pieces of armor: two helmets and a visor. The game was recently named by The New York Times as one of 2010's most anticipated games. In Battlefield Heroes, there are four sets of unique character clothing, and consumers get a pair of outfits per download, one for each side. In Battlefield: Bad Company 2 four kit upgrades allow you to become a unique Special Activities soldier, with new camouflage and a modified weapon. Kit upgrades also contain new awards and an additional achievement. I predict we're going to all be completely sick of Dr Pepper by the time this promotion ends.